AC Milan striker Gonzalo Higuain is set to join Chelsea. The Argentinean is expected to have his Chelsea medical between today and tomorrowwith Maurizio Sarri that hopes to have him available for Saturday’s Carabao Cup clash against Arsenal at the Emirates Stadium. Higuain will leave AC Milan after eight goals in 22 appearances. His relationship with the Rossoneri didn’t end up well. In particular, the relationship with Leonardo deteriorated after that the Brazilian announced that the Rossoneri may not have managed to make his transfer from Juventus permanent at the end of the season. 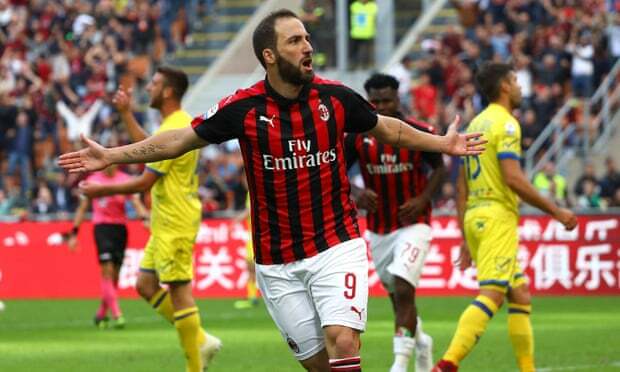 Follow the minute-by-minute update with Higuain that is expected to salute his team-mates today before leaving Milan and arrive in London.